As the most common external parasite of domestic animals, fleas are a common fear for pet owners throughout the country. There are several species found on dogs, but the cat flea Ctenocephalides felis is the most common on both canines and felines. 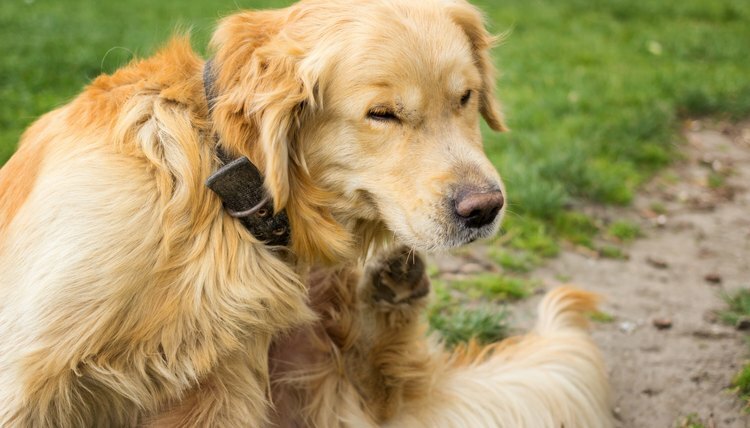 Dog fleas are similar in appearance and behavior, but are less common on cats and dogs overall. Understanding the anatomy and life cycle of fleas allows you to create an effective prevention and removal strategy when the need arises. Every infestation starts with a few early colonists. The first fleas may come from the environment or from another infested animal. These tiny parasites can spread between cats, dogs and other pets as they establish themselves in your home. In the outdoors, adult fleas stay near long grass, bushes or other shelter as they wait for a host to pass by. When the opportunity arises, they spring from the foliage or dirt and latch on to the animal. Fleas migrate to protected areas on your dog's body, like limbs, joints and the abdomen. They can appear anywhere, but are drawn to areas where the dog cannot reach them easily with his tongue or claws. A few fleas is no big deal for most pets. In fact, you may not even notice anything is wrong with your dog for the first week or two. However, it doesn't take long for a few colonists to turn into a full blown infestation. Adult fleas feed and reproduce on their host's body, so they can create offspring quickly and efficiently. A single mating female can deposit 20 to 50 eggs each day, which usually hatch within a week after being laid. The eggs are very small, so you probably won't be able to spot the tiny white specks without a magnifying glass or microscope. After hatching from their eggs, fleas pass through the larval and pupal stages of development before reaching adulthood. They emerge from the shell as wormlike larvae and begin to consume local debris and droppings from adult fleas on the host's skin. Fleas can develop in a home or in the outdoors if there is available food and favorable conditions. They cannot survive in hot or sunny areas, but they can thrive in shaded areas with at least 75 percent humidity. Larvae continue to eat for one to two weeks after hatching, then wrap themselves in a cocoon to complete their metamorphosis. The pupae hide inside their self-made shelter underneath the soil, on plants or in concealed locations within the home. Adults may emerge from their cocoons in as little as eight days after they transform into pupae. The entire development process can take less than two weeks in ideal conditions, or up to 50 weeks when they are unfavorable, according to the Companion Animal Parasite Council. Adult fleas start feeding from their host immediately after invading; females can lay their first eggs within 24 hours of eating. You may notice your pet scratching repeatedly and show signs of skin irritation, including light bleeding, hair loss and rashes. Fleas also can transmit infectious diseases between animals and are a severe health hazard for young or small dogs. Adult fleas require moisture and a stable temperature to survive. Sustained heat above 95 degrees is often fatal to fleas. They can live for over a week in near-freezing temperatures, but they will succumb to the cold if they do not find a warmer hiding place. All stages of development can be delayed by unfavorable environmental conditions. This survival mechanism allows pupae to survive through the winter through a form of hibernation.